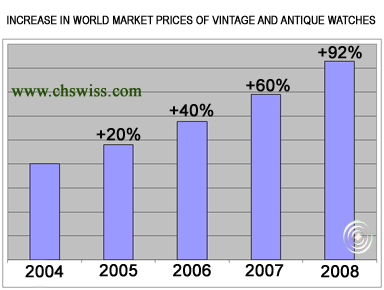 During the last few decades, the world of timepiece collecting, with all its charm and complexities, has seen a considerable increase in consumer demand. Experienced watch collectors and enthusiasts have become very knowledgeable over the years and are able to recognise a good investment. Since the 1990s, auction houses have actively encouraged growth in the watch market and, in even more recent times, e-commerce on the internet has developed into a flourishing channel for the sale of timepieces. The buying and selling of a timepiece, that was once an exchange between collectors and small shops, is now expanding into a global marketplace. New watches, even if supplied with a guarantee certificate, may come from any part of the world and may provide few clues as to their origins. This is especially true for antique and vintage watches, which are increasingly in demand and not so easily identifiable. A need has arisen for a Certificate of Registration, supplementary to documents provided by dealers at the time of sale, which legitimises the origins and characteristics of a watch. Such a certificate provides further authenticity of the watch concerned and may also increase its value. To this end, our company, which comprises of experts in fine watches and timepieces, offers the buyer the possibility of legitimising a purchase by acquiring a Certificate of Registration and entering the details of the watch into the International Archives of CHS GENEVE.